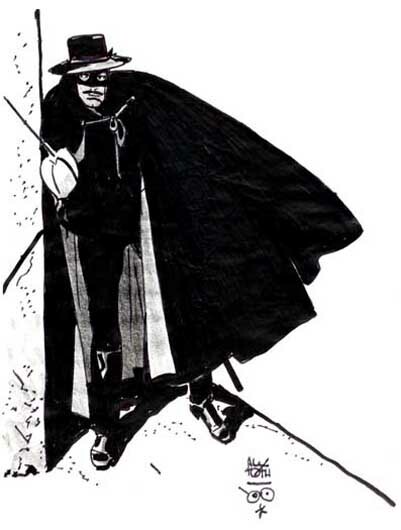 Following the pair of Zorro sketches from last week, here's a sweet page Toth did for Disney/Dell starting in 1957. From Zorro's Secret Passage, the second story in the series, Diego shows his trusty pal, Bernardo the predecessor to the Batcave. Great bits here are the storytelling, expressions and body language, variety of textures (the embroidery on Diego's jacket, the dry brush on the wooden mantle and stone fireplace, the fine feathering on Bernardo's sleeves and hair, etc), the lighting and patented Toth spotting of shadows and black areas. I scanned this from page 30 of the 1988 Eclipse Books black & white reprint of the series (Vol. 1) for which Toth himself did the tones, as it was originally published in color. One may be able to find used copies of these two volumes, but Image Comics released all in a single volume in 2001, still in print. Continuing Halloween Month on Toth Tuesdays, here's a scary short story Toth drew for Warren, written by Archie Goodwin, Grave Undertaking. 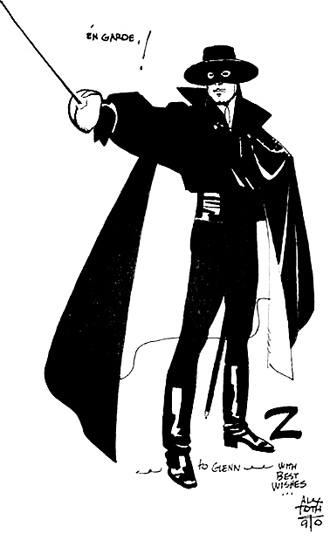 As most Warren magazines were in black and white, Toth often used duo-shade or grey tone washes and other media to take advantage and experiment. Given that these stories originally appeared magazine size, even larger than the typical comic book, it's a shame to present these in a smaller format, but at least the story is here in its entirety, all cleaned up and de-yellowed. I'll post about favorite panels from this story on Thursday or next week. Til then, enjoy...! I'm not sure who designed these three, but Toth's take on them is my favorite - big surprise! The colors above are fun and comic-booky, especially effective with the last panel all black and orange. The writing and Toth's art engage and draw in the reader - it's almost interactive! From another issue, the page above again sets the tone, with coloring mostly more subdued, the witches' faces and clothing draped in shadow. The composition of this page flows very smoothly, Toth creating interesting black/negative shapes throughout. And it's immediately apparent how distinct the three are from each other, with varied face and body shapes and features. Fun stuff! More Halloween Toth next week...! Here's something colorful and fun for a change of pace this week, a Madman pin-up did in the mid-'90s for Mike Allred's crazy character. There's no doubt Allred was highly influenced by Toth in his art style and design for Madmen, so Toth must've felt flattered and a kinship with Allred and his character. Madman seems a direct ancestor of Space Ghost, or at least a crazy cousin. It's a perfect fit. I'm not sure who did the colors for this pin-up, but they're simple, flat and beautifully done. Coulda been Toth himself, or Allred and/or his wife, Laura. As usual, Toth spots his blacks cleverly, sandwiching Madman between an assortment of odd positive and negative shapes, precariously perched atop a sliver. One can view this piece as just plain fun, an abstract graphic exercise, but damned if I haven't found myself feeling something of a Madman lately/the last 18 months. What with a traumatic physical and psychological experience, the inevitable changes within our family as time marches on, and in these uncertain economic, social and global times, I look at this image and can relate all too well. Although Madman's world here is a bit more fun and colorful! 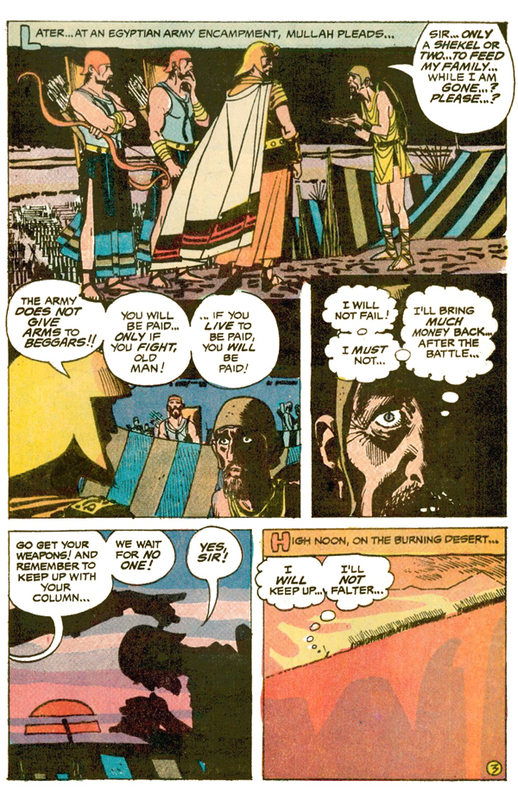 A Toth three-panel sequence originally appearing in DC's My Greatest Adventure #61, reprinted in Phantom Stranger #15. The graphic composition of this sequence from the story, I Battled for the DoomStone! is based on two main shapes: the triangle formed by the three shots of the explorer; and the "C" shape formed by the rock in all three panels, tying them together, reinforced by being the same color. Each frame is strong and serves its purpose, what with #1 showing the explorer's upward climb (shown from above and the landscape far below) and #3 with his discovery of the Kraka Stone and gorilla (from behind). But the stunning shot is frame #2, with the explorer's legs splayed out precariously between two rocks. The dangerous journey is accentuated as we see him from below, with the landscape in the deep distance. This panel is simply and effectively colored with largely natural tones. My only two minor quibbles: I wish the thought balloon in frame #2 didn't cover his arm/hand (perhaps Toth would have placed it differently had he lettered it himself?) and: it'd have been nice had Toth added just a few bits of texture to the ground in panel 3 - it looks too stark and bare. This stand-out frame from an adventure story Toth drew illustrates the interesting choices he made panel-by-panel in his storytelling. There are a myriad of ways he could've approached this, but chose to place the viewer inside the opening this explorer and his team have made. In doing so, with askew angles he crops and frames the bearded man, so all our focus is on him, but the huge area of negative space he gives us on the side and top of the block throw the composition off balance, an effect further enhanced by the explorer being shown crouching down and horizontal. It's all a clever method to create suspense and tension, move along the story, and communicate spatial relationships and proportions. It certainly makes me curious what's inside/behind that wall. The coloring isn't good, doing no service to the story, artist or reader. Though using primary colors, mainly, trying to keep things simple, apparently, the colors are ill-chosen and out of whack. The red used in the narration box draws too much attention, the blue of the opening is too saturated - better if it were toned down and greyed-out a bit. The man and the light we see through the opening is fine, but his hat should be lighter, certainly not the same color as the block. Oh, well, it can't all be perfect - just a quickly colored and cheaply printed comic, after all. But It'd be fun to see this panel sharper and in black and white, as it would show what time, effort and thought Toth put into a simple frame of a simple comic. If anyone has access to it, please forward to me. 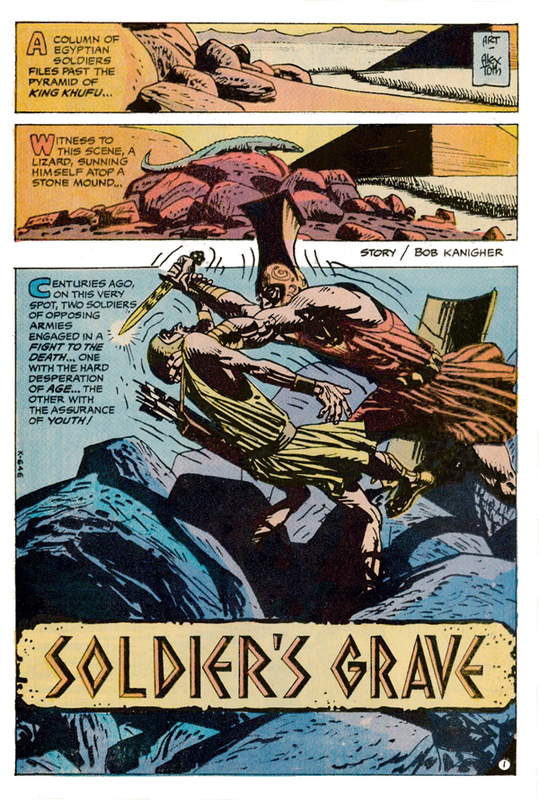 This week I feature the entire Soldier's Grave Kanigher/Toth story I've touched on the last couple Toth posts. This is one of my favorite Toth pieces, an unsung gem. I'll comment between pages, but if you haven't read if before, it might be best to read through it first and ignore my comments til after. I scanned these pages myself from my beat-up, yellowed copy of Our Fighting Forces #134, cleaning up and tweaking extensively in Photoshop to sharpen and pop the images, darken areas of black, and to match the color tones and hues from the printed page as best I could - remastered, if you will. I daresay this is the best these colored pages have ever looked. Now, read on! Toth opens with a couple long, horizontal panels, setting the scene and tone, and the coloring is decent, reinforcing the harsh mid-day shadows and helping to convey the desert heat. 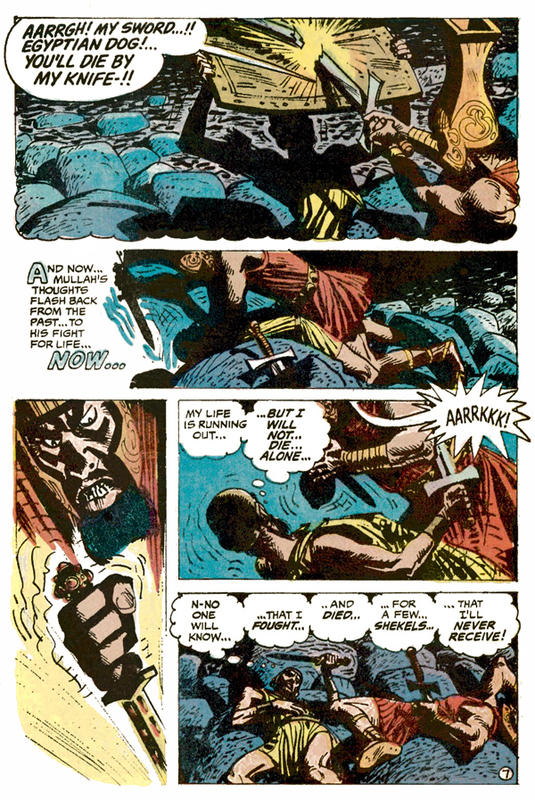 Kanigher then jumps us back centuries, throwing us smack dab in the middle of the fierce action of battle. This page is largely constructed by a series of triangles: not only the pyramids, but the lizard atop the rocks, and the two soldiers from the top of the attacker's helmet following down his blade to the rock on the left, and his lurching body on the right, both leading to the carved-in-stone title base. The title indicates the fate of the soldier, so we pretty much know the end in advance. Then, with a series of close-ups and more angles, Toth brings us tighter into the fight, first with a cropped close-up, focusing on our humble soldier and the danger he faces, even more on his opponent's grip on his neck and threatening, dangerously close point of the blade. In frame 2, we see the blade, an important object in this story. Frame 3 pulls back a bit, but everything we need to know about this story and its conclusion is contained within, including the shield in the background. Next, the creators employ another slight flashback as the soldier leaves his family and explain why. Toth uses silhouettes, a distant horizon and sunset to set the mood. Page 3 is a super page, establishing the Egyptian army and camp, and its leaders as old Mullah pleads his case. The two panels int he middle tier show us the motivation and desperation of the main character. With the lower tier, Toth uses another sharp silhouette before pulling way back with a magnificent use of negative space, and showing us Mullah's place in the army, and thus his plight and challenge. The coloring is simple and effective, toned-down when it needs to be (only two colors are use in panel 3), then alternately subtle and bright conveying tone, time and atmosphere. Nice stuff! 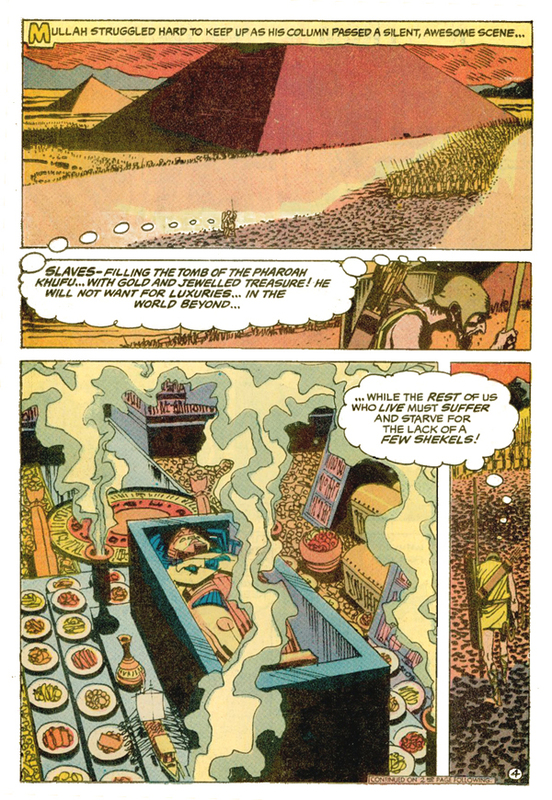 Another well-colored page, as Mullah contemplates his place in the world, as he falls further behind the marching army. 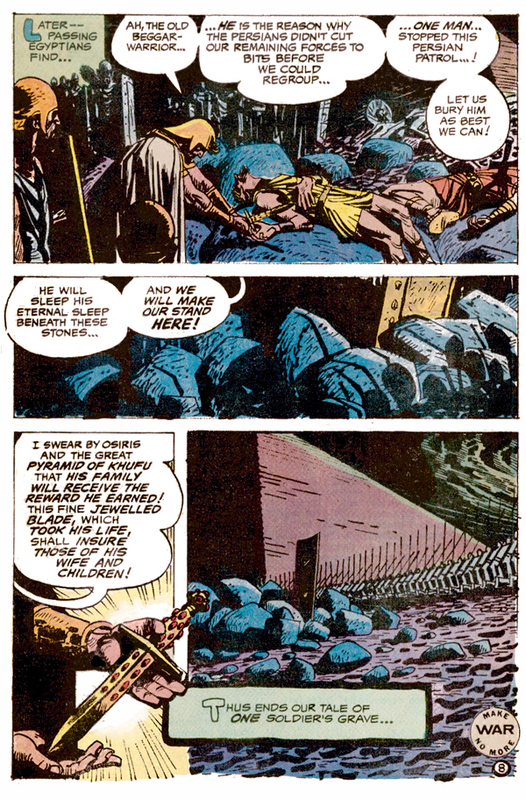 I love how Toth uses varied panel shapes here: first showing the size of the pyramids relative to the tiny soldiers; Mullah's weariness and slumped shoulders; a Pharaoh's after-life opulence; and cool vertical frame with Mullah surrounded by the other soldiers' footprints. Now, Toth goes all horizontal as Mullah falls completely behind. Super coloring again, as the first frame is left colorless, Mullah's silhouette now totally merged with the footprints in the sand. In frames 2 & 3, the heat is turned up with yellows and golds, then orange and red. The bottom half of the page is cool as nightfall descends, and the exhausted Mullah figures he's lost his chance. For more analysis of this page, see this previous post. 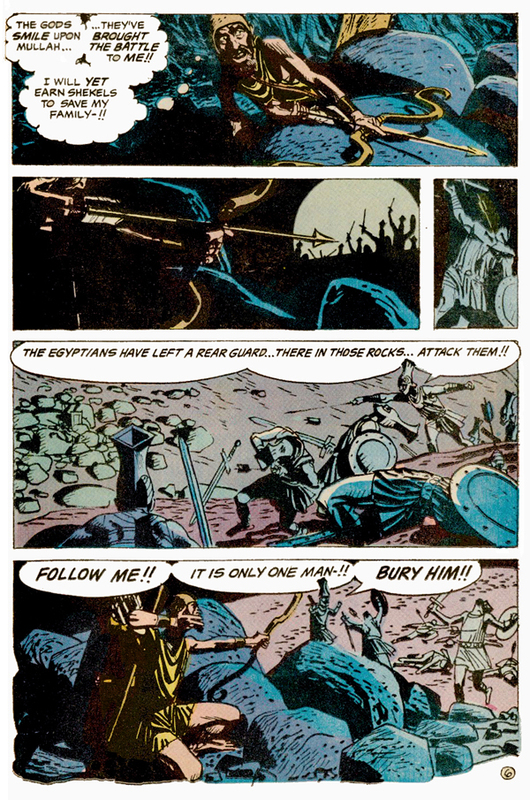 With page 6, Mullah's age and weakness has turned to his advantage, as he plucks off one enemy after another with his bow and arrow. That 2nd frame is brilliant, all moonlight, rim lighting, silhouettes and the flecks of light on the stealthy Mullah and his weapon. Page 7 brings us full circle, back to the main battle. The two figures are colored warm and hot against the cools of the night background. Other than frame 3, where Toth gives us a brutal close-up of the enemy's face as he makes the fatal plunge of his blade, Toth instead focuses not on the characters, but rather the action and actions with body language, folds of clothing, etc. I find his approach effective here, since he's already established the characters, he highlights the futility of war in general human terms. The soldiers are not personalized here, but the EverySoldier, obscured by shadow, turned and cropped heads. Others may find his choices here cold and distant. 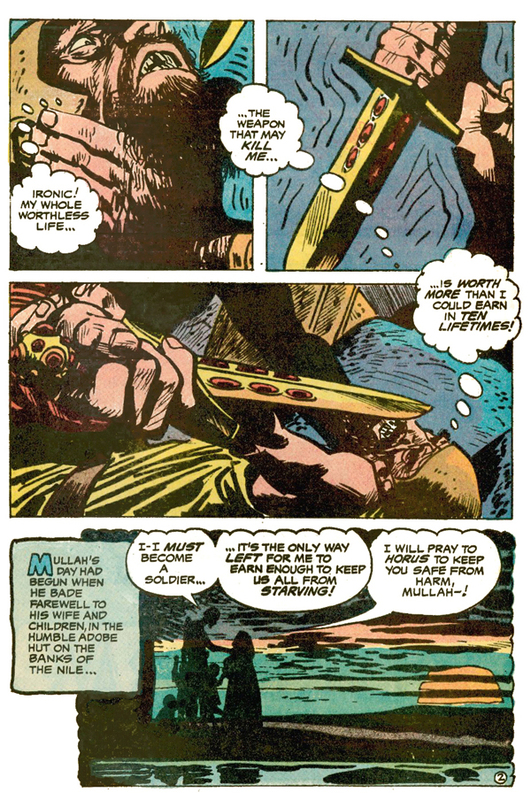 I love how Toth conveys Mullah's triumphant but hopeless state through twisted body language, as he breathes his last. But unknown to the departed Mullah, he's saved the day, provided for his family who will be presented with the very blade that felled their savior. The other primary object of the story is highlighted in the 2nd and last panels, the shield we saw earlier in the story, now and forever serving as grave marker for Mullah and the sacrifice he's made.